As we grow older, we tend to become control freaks. We need to control everybody and everything, moment by moment, to be happy. If the now has never been full or sufficient, we will always be grasping, even addictive or obsessive. If you’re pushing yourself and others around you have not yet found the secret of happiness. It’s okay as it is. This moment is as perfect as it can be. The saints called it the sacrament of the present moment. –Richard Rohr, Everything Belongs. I recently took a six week sabbatical, and one of the best things I began during the sabbatical was counseling with Terry Ewing of Plumbline Ministries. One of the big issues many of us deal with in counseling is control. The question could be framed this way: Are you God? Or are you not God? It seems a ridiculous question. Of course I’m not God. But sometimes we act like we think we are God. As Richard Rohr says in the quote above, as we grow older, we tend to want to push ourselves and others around, judge, tell others what they should and shouldn’t do. A counseling professor I had years ago called this “shoulding on people.” We spout opinions about the way the world should be if we were in charge. We think we’re all knowing because we have a phone and the internet. We take on much more responsibility for situations sometimes than we ought. It was helpful to me last week in a couple of situations to simple step back from getting emotionally involved in a problem at home or work and ask myself, “Am I God? Can I control this situation?” No. This is the stuff of AA or CR or the Serenity Prayer. “Lord, give me the serenity to accept the things I cannot change.” Stop there. This means everyone around you. You can’t change people around you. The prayer could helpfully add, “and people” to read, “Lord, give me the serenity to accept the things and people I cannot change,” which is to say everyone around me. Sunday as I preached I asked the church to repeat, “I am not God.” It felt good for some to release the pressure to carry burdens only God can carry for us. I am not God, and as such I do not control the world. I can cry or be pained for the world, lament war, famine, refugees, and do something about it by planning my life around helping the poor, the refugee, and bringing peace wherever I’m present, but I cannot ultimately change the world’s situation or carry the burden of the world on my shoulders. I am not God. There was a man named John the Baptist who made a public confession that he is not God. He had to. He was over-appreciated. People thought he was from above. They thought he was the Messiah. Or they thought he was a prophet come to announce the Messiah. Some people in the days John the Baptist lived thought Elijah would come back and herald the coming of the Christ. So it became important for John to proclaim what he was not. Later, some of his disciples saw Jesus with his disciples on the other side of the river baptizing (John 3:22-36), and they stirred the pot with John, seeming to prompt comparison and competition between John and his cousin Jesus. Here, after already saying who he was not, John goes further to describe himself only in relationship to Jesus. He says something that is golden and rings down through the years to us today as a mantra that could change our churches, our families, our lives if we took this into our lives as well. NPR’s Morning Edition tells the story of Julio Diaz, a 31-year-old social worker from New York City who after work one night exited the subway onto a nearly empty platform. As the train left, a boy about twelve years old was standing near Diaz. The boy pulled a knife to threaten Diaz and asked for his money. Diaz gave the boy his wallet and the boy fled. Before he was too far away to hear, Diaz shouted at the boy and said “Wait! You forgot something. Here, take my coat.” Diaz was taking off his coat when the boy stopped, turned around, and looked puzzled. “Are you crazy? Why are you doing this?” the boy asked. The boy agreed to join Diaz. They walked to the diner and sat in a booth. Soon the waitress came by and asked Diaz if he’d have the usual. She chatted a few minutes before putting in the order. The manager came by the booth to say hello to Diaz and his young friend. The dishwasher came out to say hello. “Well, haven’t you been taught that you should be nice to everybody?” Diaz asked the boy. “Yeah, but I didn’t think people really acted that way,” the boy said. The social worker in Diaz saw an opening. He asked the boy what he really wanted out of life. The boy’s face was downcast, and he didn’t have much of an answer. The boy took the $20 and handed over his knife to Diaz. I don’t know what Diaz’s beliefs are, but he was living like a man who had a mantra like John the Baptist’s: He must become greater. I must become less. My money must become less. My coat must become less. My time must become less. My own life must become less. The person right in front of me is Jesus, and Jesus must become greater. Diaz lived not just the mantra of John but some of these exhortations of John the Baptist. What would it be like to live the mantra of John the Baptist, “He must become greater. I must become less”? When my wife was pregnant with our first child, I gained some sympathy weight. I was also eating for two! I didn’t need to gain more weight. Jill needed to gain weight, so I went on a diet and called it the “She must become greater, I must become less diet”! When people think of you, who is bigger in their minds? Jesus or you? If I were to write the name Arthur Conan Doyle, would that mean anything to you? Of course you could google it, but without doing that, do you know who he is? And yet he created a character you most certainly know. He created a character bigger than himself as a writer. Stephen King is a name you know because he has sold millions of books. And probably in his day, people knew Doyle, but the character he created was so big it continues in our imaginations today and is recreated over and over in dramas and stories. The character’s name is Sherlock Holmes. Living this mantra of John he Baptist is not easy or immediate. In fact, it’s more like the process described in the song I heard as a teenager when an elder of the church I attended stood up and read all the stanzas in a monotone, but all these years later I remember it and asked our worship leader, Cory Legg, to lead the song in our worship. The song title is, “None of Self and All of Thee.” But the four stanzas progress from early discipleship where the disciple proudly says, “All of self, and none of Thee.” As life’s trials come, the disciple says, “Some of self, and some of Thee,” then later “Less of self, and more of Thee.” Finally, humbly the disciple says, “None of self, and all of Thee.” This is a lifetime of discipleship and step by step emptying of our selves as Jesus emptied himself (Philippians 2). One version of the prayer says, “Christ in the mouth of everyone who speaks of me.” Who is bigger? What does it mean to live this mantra in each of our lives. For a ministry at our church that does media during our Sunday services, their mantra is “do not distract but point people to God.” They want the microphones, sound, projection, video all to work without distracting from the point of it all: Jesus. This team of media volunteers want, as John the Baptist wanted, to point to Jesus. He must become greater. We must become less. What does it mean for a church as a whole to take on the mantra of John the Baptist? My opinion must become less. My ministry must become less. My preaching must become less. My worship singing or playing must become less. My family, my children, my grandchildren, my job, my reputation, my, my, my . . . must become less in order that Jesus becomes more. He must become greater. I must become less. I started Harding about Prock ending his coaching career. My cousin, Brooks Davis, played football, and I lived on the “football wing” of the freshman dorm. So I knew many of those named in the book in this era, making it a fun and personal read for me. In addition, I worked for Ken Bissell in the Public Relation-Sports Information Office. We worked the Bison football games. Before computers, Ken and I announced the official play by play to the media in the press box. I have to admit, I don’t think I was the greatest at this job, and sometimes I would get confused figuring a punt from line of scrimmage, where it was received, then the return and the net yardage gain or loss. We had to do this pretty instantly and record it on a big spread sheet, and Ken would announce to the media in the booth what the official play yardage was, who ran it, who tackled who. It’s crazy, and it’s what happens behind the scenes of bigger, high stakes games televised, but it all comes out pretty smooth when we see it on TV. With that background, I was able to see how diligently Ken works, and I know he put his heart and soul into this book. It shows. Ken tells the story of John Prock growing up in a hard scramble Oklahoma town with less than ideal circumstances in his family. 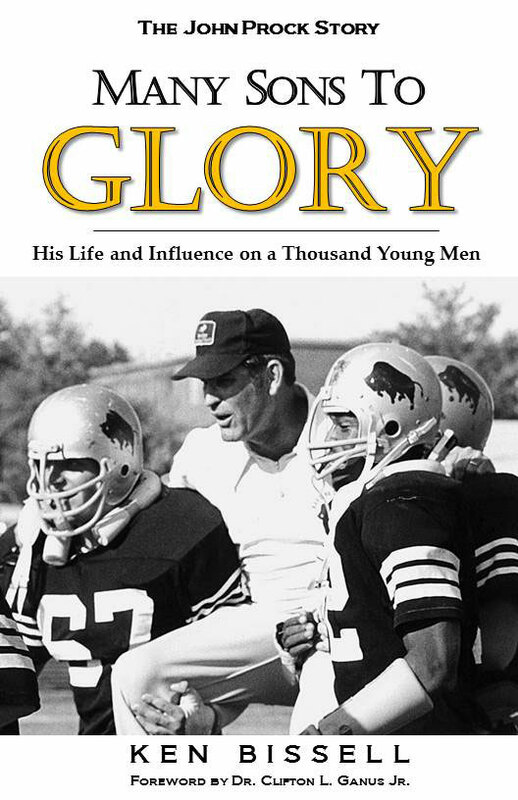 Complete with lots of photos, which heightens the interest of the book, Ken brings readers up through Prock’s high school days and details how he made it to Harding as a coach in the 1960s as one of the coaches to re-establish the football program that had been discontinued at some point before. Prock coached three decades and I was struck at how he influenced so many lives. Not to put too fine a point on it, but I look at my life as a preacher and wonder if I have had the kind of influence on 1,000 men like Prock has had. Story after story in the book shows how boys came to be men under Prock’s program. A large portion of the book is ten feature profiles of men whose lives have been changed under Prock, both players and coaches. Over and over men say things like, “If it hadn’t been for John Prock, I wouldn’t be coaching young men today.” Imagine, he didn’t just influence 1,000 men. If only 100 of those became coaches and have the same kind of influence, he influenced 100,000 young men! Ken also mailed out more than 600 letters to former players, and received back stories from seventy-five of them! Ken placed these stories in full in the book in the order they came back in. The stories are touching, funny, and say the same thing over and over: Prock was one of the best Christian men I ever knew. Stories of coach and his wife caring for sick football players in their dorm by taking them chicken soup when they had the flu, inviting the team over, having “football church” on Wednesdays, humor and sayings, and ways the coach confronted players, apologized when he was wrong. I was reading the other day in the Lusoga Bible as I occasionally still do, and think and pray for you. I’ve been reading in the Gospel of John to prepare for writing a book with friend, Randy Harris. The passage I read that I wanted to discuss with you today is John 9:1-2. I’ll quote the text below and give a discussion question and you can write comments if you wish and forward this to other’s on Facebook. Who would have known in the 1990s that we’d be keeping track of one another by Facebook till we meet again on earth or in the New Creation!? Those of you in Uganda or Soga speakers elsewhere can use this text and discussion question for Bible studies with non-Christians and Christians both. Those who don’t read Lusoga can look up the text online, whereas it’s harder to get the Lusoga text online or in books. We were so happy to celebrate with 1,000 partiers the first ever Lusoga full New Testament being published in history in 1999. In English, “n’ani eyayona?” of course means “Who sinned?” but the slang of American English would be translated something like, “Who screwed up?” This is not a nice way to talk really, because screwed is also a sexual term in English, but it can be used informally to mean, “Who made the mistake?” For English only speakers, the Lusoga word eyayona is a word for sin. Jesus tells his disciples neither one is the right answer. 1. What do you like about this story? 2. What do you not like about this story? 3. What is this story saying to the audience that originally received it and to us today? 4. What is this story calling us to believe? 5. What is this story calling us to do? 6. Would you share this Jesus story with one person this week? Bwe yamala okwogera ebyo yaafuudha ku itaka [katogo — ha! ], yaakola ekisoodo mu matanta n’enkungu yaakibaka ku maiso g’omusaadha. Yaamukoba ati: “Ja onaabe mu maiso mu kidiba ky’e Siloamu,” (eriina eritegeeza, “atumiibwa”). Kale yaaja, yaanaaba, yaira ng’abona! I’m proud of my son, Jacob, winning the first-ever Run to the Well 5K March 28 with a time of 18:52. The run benefitted The Kibo Group and communities in Uganda needing good water sources and community development. At a Kibo Group, God moves us to partner for transformed lives through sustainable community development. Big thanks to Mary-Margaret Watson and Jordan Smith, race coordinators who registered more than 300 participants in Run to the Well 5K and 1 mile fun run. Jacob and I after the 2012 Tulsa Run. He had just completed his longest run to date and in an unexpectedly quick pace. The moment captured in this photo is seconds after Jacob ran his first Tulsa Run, a grueling 15K race that I ran when I was his age. OK, I ran the two mile fun run in about the same time he ran the 15K. I was so proud of Jacob that day to see him appear on the last sprint to the finish line minutes before expected. When I got to him, Jacob was ragged and worn but so happy he’d completed his longest race to date. Jacob’s running began in 2011 with a 5K our church held to raise funds for our kids camp. I thought I’d hang with Jacob, who was 12 at that point, but the race started and I couldn’t catch him. He ran with Steve Martin and Jeff McIlroy, and those guys will always have my admiration for the way they’ve encouraged Jacob’s running (and still run with Jacob, even as recently as last night!). Jacob’s life, however, is not about running. Jacob’s life is about pleasing God, learning to be like his savior and Lord Jesus Christ, and enjoying family and friends. He knows that running is not for himself but to glorify God. He is using his gifts and working hard to develop them. Happy Birthday, Jacob. I’m very proud of you. After speaking with our nephew, Drew Taylor, about a horrible accident he was in, my brother and Drew’s uncle Bubba (Brent) wrote a much better account than I could have written, with some memories I had forgotten at least to correlate. Brent, thank you for using your gift to share what is a important perspective: that we can’t explain what happened at 1:15 am on a Kentucky interstate, but we can “explain” — as Bruce McLarty put it — what the body of Christ does when we can’t reach our loved ones. We rally and come together in the great love the Father has for us. Eugene Peterson’s Eat This Book inspired — of course — the title and some of the content in the following two sermons. There is more in the series that we’ll be posting at www.garnettchurch.org. Details develop in fatal student accident. Jill and I are teaching our third and maybe last person to drive. We’ve taught each of our children to drive with AAA’s Parent Taught driver education system. They study the book, we sit in the passenger seat and help them get 55 hours of driving experience before taking their test. We originally latched on to AAA because this reduced expenses for the driver’s ed and lowered our insurance premiums when we got insurance through AAA. With a teenage boy driving now, our insurance premium is sure to go up. If I had a chance to do it over, I’d repeat the same process. There is nothing like being right there for each moment of your children’s learning to drive. This is a huge rite of passage in our culture, getting your license, and these captive moments are often some of the key places our pre-driving teenagers are still listening intently to soak up what they can about how to be safe and make it from one place to another. Half way through the training, you can actually begin talking about something else besides the driving, with only the intermittent, “Yeah, there was a curb there, and you found it, yes” comments from the parent. Walking along a path, jogging, driving, the act of going somewhere together prompts us to talk, and I don’t know all the reasons why. I do know that I want to be there for these times with my children, when they realize what they’ve been watching us do is not as easy as they thought, takes much practice and eventual muscle memory that must proceed being full-enough aware to achieve frogger (that’s an old parent reference for you) status when turning left into a busy street. If you are considering teaching your children to drive and weighing this versus sending them off to a driving instructor, consider this: who would you rather teach your children to operate the most deadly invention since the dawn of creation? I know there are some experts who can do better at the techniques or know the road rules better, but there is no one who cares more for your child than you do. Do you have the patience, the fortitude or courage to watch without sucking all the oxygen out of the inside of the car every time your child has a close call, or flat out screaming? You’ll never know until you try it. You will have to be in the car for some of the practice hours of driver’s education anyway. You might as well be called the teacher as well as the parent.